Since I’m taking this week off from my usual Freezer Cooking in an Hour session, I’m going to post my session from two weeks ago that I never got to post because I ran out of time since we were preparing for our trip to Texas. 4:30 p.m. — I stick the chicken in the oven and then promptly get distracted cleaning the kitchen up from the mess that was leftover from lunch and our school lessons for the day (yes, I know, I should have cleaned it up earlier, but you know how some days go!). 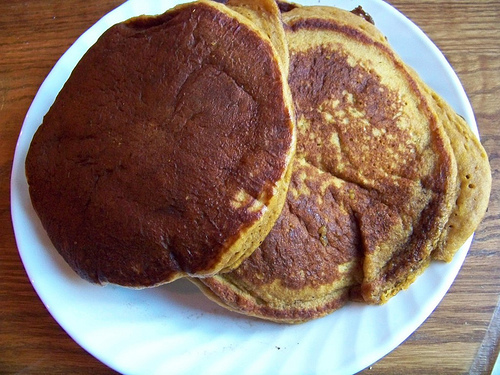 4:40 — I determine not to get sidetracked again and get online to look up the pumpkin pancake recipe. I start mixing up the pancake batter only to realize I forgot to set out the buttermilk earlier. And of course, our microwave is still incapacitated (it’s been out of order for almost two months and, most of the time, we’ve barely noticed it. But there are a few times–like today–when it would be really nice for it to be working!). I stick the buttermilk in a hot water bath and finish mixing up the pancake batter. 5:00 — The pancake batter is finally ready to start cooking, so I pour the first pancake on the griddle and go downstairs to lug my KitchenAid up from the basement pantry in order to start making the Honey Rolls. 5:15 — Silas is up from his nap, Kaitlynn and Kathrynne are finished with their quiet time and craziness ensues. They “help” me put the roll ingredients into the mixer (and spill quite a bit of salt in the process–oops!). 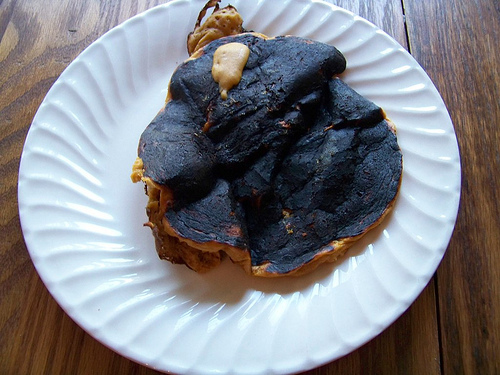 Note to self: If there are 15 things going on in the kitchen at once, set the timer when cooking pancakes–if you want to be able to eat any of them, that is. Gratefully, only a few of the pancakes end up rather burned. The rest can be salvaged. 5:20 — While the roll dough is mixing, I chop up the chicken and bag it for the freezer. It’s so easy to bake and chop chicken for the freezer and it’s so nice to have on hand for making homemade pizza. 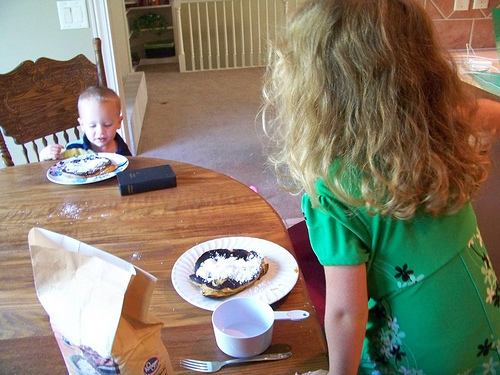 5:25 — I sit Kaitlynn and Silas down at the kitchen table to eat a pancake to tide them over until dinner. I get this “brilliant” idea to have them sprinkle powdered sugar on top instead of syrup. Um, you’d think I’d know better than to let them help put the powdered sugar on. Oh well, I scrape most of it off and they enjoy their pancakes while I hurriedly try to finish up the Honey Rolls. 5:35 — The roll dough is rising and I quickly clean up the kitchen and get dinner finished. 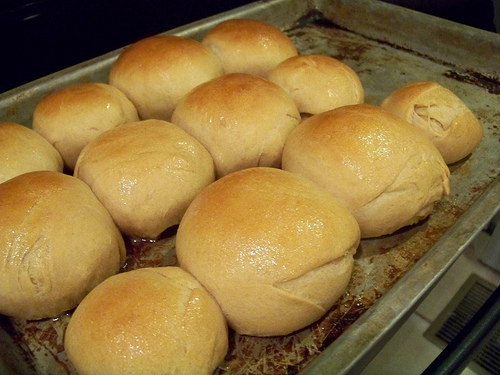 After dinner is done, I bake the rolls–and they turn out really well. The recipe is definitely a keeper! And just for fun, here’s a picture of my Bread Machine Pitas that I made the day before. I didn’t love them as much as we liked our non-bread-machine pitas, but they still turned out alright and were a piece of cake to me. Anyone have another bread machine pita recipe that you’d recommend? Have you done any cooking or baking ahead recently? If so, I’d love to hear about it! You have inspired me to bake muffins again, it had been a while. I made banana muffins and they were really good. Thank you so much for posting different recipes. My husband is so grateful for the breakfast burrito. It makes breakfast so easy. Where can I find your recipe for the honey rolls, they look wonderful! The link doesn’t take me to the recipe…thanks! I just started freezer cooking. I did about an hours worth yesterday of the Butterhorns recipe and some egg and cheese muffins. The egg and cheese muffins will be great for my DH’s early morning shift days. The Buttherhorn recipe was so easy we can’t wait to taste them. Thanks for continuing to put the freezer cooking on your site its motivating and gives me new ideas to try. Wondering what the honey roll recipe is. When I click on your link it takes me to your menu and I can’t seem to find where the recipe is. Maybe I am missing something? Ditto! I would love to try it as well! Having this issue too. Thought I might make them for dinner this weekend. Me too. The honey rolls look awesome and I would love to have the recipe. Please update the link. Thanks for updating the link! Will try these tonight. Looking for the honey roll recipe too. . . yummy! Lately, I have been not doing the lunch clean up (just me and 2 of the kids) until later, on purpose. I find it more efficient to do it as I’m cleaning up supper prep — or let my husband do it with the supper dishes. Plus – it’s a dreary, boring task. Why not just do it twice a day instead of three times? Helps my morale to not feel as though I’m stuck in the kitchen all day! The rolls look yummy. Am I missing the recipe on your link? I didn’t see it. Thanks. I just started baking again as well since it is getting cooler! I always bake in bulk and even cook in bulk as well. Like when I make dinners we eat leftovers for at least 3 meals off of that one time cooking. Cook once and eat twice, three, or four times :-). Saves on a lot of cleanup! 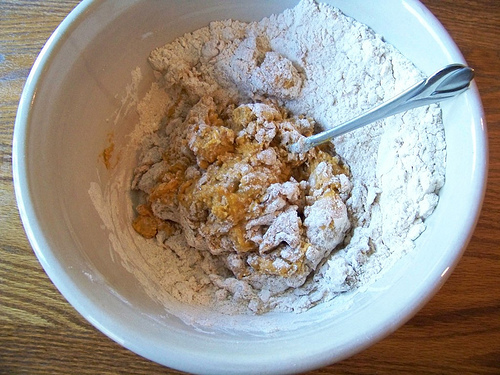 Here is one of our favorite super easy biscuit recipes – I think you’ll like it: http://wholenewmom.com/recipes/easy-drop-biscuit-recipe-w-gf-df-options/. Make several batches in a flash and store them for quick lunches, breakfasts and snacks :-). Maybe you’ve said this before and I just missed it, do you freeze whole cartons of milk for later use in baking? Yes, I do this quite often when I’m able to get them marked down. Thought I posted this. Sorry if it is a repeat. Do you refreeze your meat? I was under the (possibly wrong) impression that you were not supposed to refreeze meat. Being able to would revolutionize my cooking. Would love any thoughts on it. You can refreeze meat if it hasn’t been cooked before (i.e. 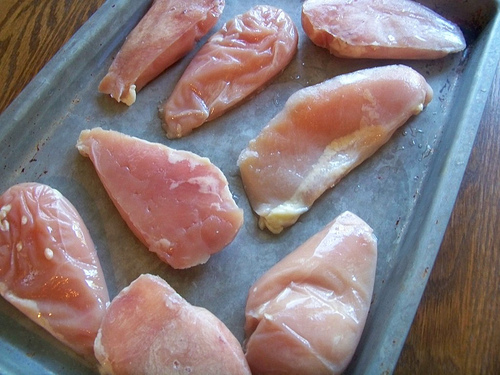 you can thaw uncooked meat, cook it, and then refreeze it). I do it all the time! We had an incident this summer where the freezer door was left open and a lot of the meat thawed. I don’t have the link as I’m on my phone but the FDA site says you can refreeze meat as long as it’s still cold. The texture could be compromised supposedly but we didn’t notice a difference. It’s not something I would do regularly but it worked our ok. Thanks for the heads up on the buttermilk. I never thought about freezing it before! I am just starting to freezer cook again. Made three batches of breakfast sausage with apples this morning. Did not take much longer than making one! It may be too early in the morning for my brain to be working, but I don’t see the honey roll recipe ? They look awesome and I want to try them. I did some freezer cooking yesterday too, and about half way through I found myself wondering why I try to do these things while my children are awake. It was an interesting, messy morning :). I made the pumpkin pancakes, marinated chicken, and the blueberry muffins off of passionate homemakings website. And it only took me four hours to get it done lol! I guess there are some of us in life who can make pancakes and some who can’t! I’m terrible at making pancakes! I can cook anything else in the world except a pancake. We just don’t eat them at my house! That is so funny. I have problems with waffles but not pancakes. My waffle iron gets super hot and I have to keep a keen eye on it. It’s older so it doesn’t tell me when they are done. Pancakes however, my griddle cooks very slow so they always turn out perfect? Also would love the honey roll recipe! The link is to a different post. 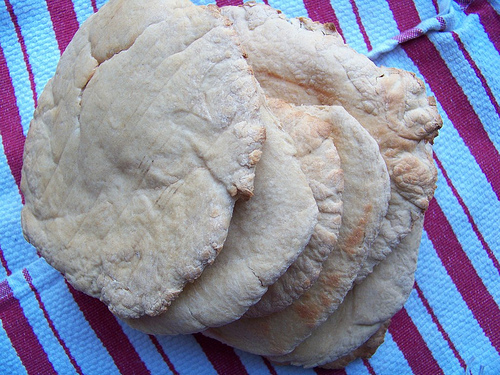 The recipe I use for pita bread is over at Farmgirlfare.com. It is under her most popular recipes. It is not a bread machine recipe but it is super quick and easy. To make fool proof use high gluten flour. She also has an awesome tutorial. http://www.farmgirlfare.com/2005/09/pita-pita-i-too-much-eata.html . We use pita bread for taco shells and sandwiches. Love them! Good luck. 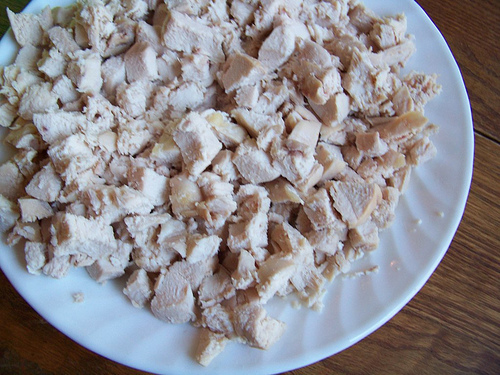 I love the idea of cooking and shredding/and/or cubing cooked chicken for the freezer. Once your chicken is cooked, and frozen, does it taste dry at all when you’re using it in a recipe? It’s more moist if you bake it, I’ve found. Also, make sure to not overbake it and it should still be juicy and tender when frozen and thawed. How long do you bake the chicken and at what temp? I would like to try it. Super, thanks Crystal! :). Happy Cooking! Okay, THANK YOU for being real and posting your burnt pancake and the craziness that ensued while trying to do your freezer cooking! 🙂 It looks like you were able to get alot accomplished in that hour, though! I made taco spaghetti for the freezer last week, as well as some muffins, waffles, pancakes, and burritos. We were going out of town, and I needed food for the grandparents to feed the kids. The taco spaghetti recipe is from the Better Homes and Garden Make Ahead cookbook, which I highly recommend. It was a gift to me, and I use it often. Almost every recipe has been a real winner, whether I’m making it ahead, or to eat immediately. Some are for the freezer, and some are to make the morning before you serve it at dinner. There is also a chapter on using leftovers in another meal. The recipes are mostly from scratch – no 3 ingredient casseroles with Campbell’s soup. Taco spaghetti? I must have this recipe! The best bread machine pita recipe is found on Tammy’s Recipes. They turn out great every time and are super easy to make. She has a recipe for white and whole wheat versions. Hope that helps! Thanks! I didn’t realize she had bread machine instructions for pitas; I thought hers could only be done by hand. I double-checked again and realized that you can do hers in the bread machine. Yay! I was going to leave a comment recommending Tammy’s whole wheat pitas, too- they are GREAT, super easy with the breadmaker dough cycle, and fun to watch bake. I usually make a batch weekly! I’ve tried using part bread flour when I did not have enough gluten for the whole wheat version, and they still turn out great! However, my “method”, which I’ve used with 3 different brands of bread machines, is even simpler. Here is my pita bread recipe. 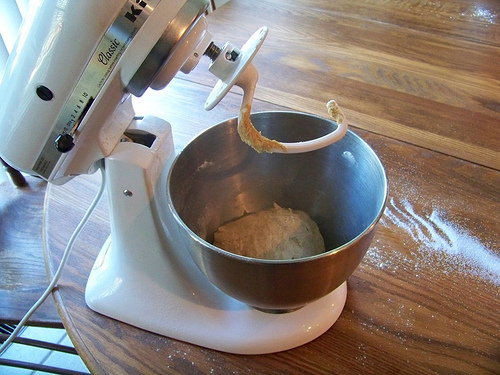 It is very good and very easy with the bread maker. Below is the pita bread recipe. I got this from my bread maker’s manual. 1 1/3 cups of water 80 degrees F/27 degrees C.
Place in order of bread machine instructions, use dough cycle. Place on a lightly floured surface. Divide into 10 pieces and shape each piece into a smooth ball. Place 5 balls on a large baking sheet. Place the remaining five balls on another baking sheet. Let rise about 20 minutes. With fingertips flatten each ball into a 6 inch circle (I used a rolling pin). Bake at 500 degrees F for 5 minutes until puffed and tops begin to brown. Cut each half to form 2 pockets. **And I know you like those buttery bread machine rolls and I just recently used the dough to make homemade hot pockets. I did a pizza one and a chicken and cheese one – great for the freezer! I’m so glad to see I’m not the only one who gets too many things going at once. 🙂 Except I probably would have had a load of laundry going and the dryer buzzing at me the whole time. I think it is ironic that this post follows the I can do anything post. Just in case re read I can do anything, not everything then return to the freezer cooking post and be very proud that you did get so much into the freezer and don’t worry about some extra powdered sugar or burnt pancakes. LOL, thanks always for sharing your grateness 🙂 you always make me smile. Ha! I agree with the other comments. Thanks for being so real. It sounds like something I would do! I really enjoy your blog and read it almost daily. I admire the fact that you are organized and goal oriented. Even though I usually feel “behind the 8 ball” (and I’m in my 40s – yikes!) you inspire me to keep trying to stay on track! Blessings to you and your family. I also want to thank you for the idea to freeze buttermilk. I buy it with the same clearance sticker you do, but I never use it all before it expires. In the future, if you haven’t thawed your buttermilk yet, you can make it yourself with 1 TBS lemon juice or white vinegar and enough milk to make 1 C, let it sit for 5 minutes. I haven’t bought buttermilk in years! I made pumpkin pancakes for the freezer this week, and they were excellent. I just used my regular buttermilk pancake recipe, and added canned pumpkin and pumpkin pie spice. I also made pumpkin muffins today, and will be adding them to the freezer. I LOVE fall and cooking with pumpkin! I only had Rice milk on hand and I didn’t even think to make homemade buttermilk with it (yes, I often overlook the obvious!) Has anyone tried making buttermilk with Rice milk, by the way? Does it work. I’ve found that storebought buttermilk works better than homemade in pancakes (they seem to turn out a lot fluffier), but I only buy it if I can get it really reduced. Otherwise, I just make my own. I just looked and read from America’s Test Kitchen that soy milk thickens when subbing as buttermilk, while rice milk doesn’t because of the protein lack. We’re not fans of soy here (the mild estrogens), but I don’t think I’ve ever bought rice milk. I’m now wondering how coconut milk would work in pancakes…that sounds really good to me, actually! Have you ever used club soda in buttermilk pancakes? I haven’t tried it, but I’ve heard it makes them fluffier as well. I just made pancakes with coconut milk (the vanilla refrigerated kind) and they turned out well. When my husband and I moved into our apartment last June, it didn’t come with a microwave, which is common for our new area. We have a small apartment with a small kitchen and not a lot of counter space. Like you, I don’t like a lot of clutter on the countertop so we decided to see how long we could live without a microwave. (What’s the point in buying one when a house we’ll be moving into next year will have one?) I’m happy to report that we still have not purchased one. When I moved into my house three years ago it didn’t have a microwave and I didn’t bother buying one. I haven’t really needed it and have found a way to do everything without one. I actually have one I keep in my basement (it’s really old and I got it practically free) that I use only to warm my rice bag, for when I have sore muscles. Some people can’t believe that I can live without a microwave, but I don’t even miss it! Sour cream is the pancake superhero in my opinion! You have to try! Everytime I put it in my pancakes they come out just like they say little pan cakes. They are so tender and fluffy. My favorite recipe is from Bon Appetit. It also uses buttermilk. I’ve actually never used store bought buttermilk so I will have to try that to see if I can notice the difference. There are many variations I’m sure but I can tell from a picture if the pancake has sour cream it makes that much difference and for the better!! Oh and made your pumpkin chocolate chip muffins today. They have been a staple around here every fall since you posted them. I also use banana when I don’t have pumpkin and they are equally delish!! I’m looking forward to trying the butterhorns sometime soon. They have been on my mental list since you posted them. So do you just substitute sour cream straight up for milk? I’m intrigued and must try this the next time I find a good deal on sour cream. It is in addition to it. Here is the recipe. It is from Bon Appetit so I cant claim it as my own:( but I’ve been using it for a long time. It does use a lot of sour cream so if you want to be more conservative with it I recently found a recipe on simpleorganizedliving.com, she actually posted it on the plan to eat site here http://www.plantoeat.com/blog/2011/08/the-perfect-pancakes/. Its not the same exactly I do think the following recipes a little richer and more substantial in size I guess you could say but price wise the above only uses 3 tb sour cream so you could always mesh the two recipes : (I did try both recipes) That is one place where I saw the pic and knew they had sour cream in the recipe before I read it :). 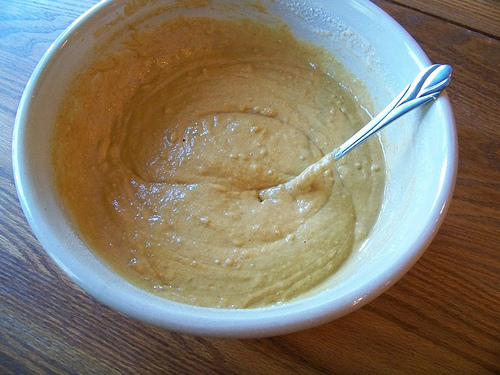 about 3 tablespoons of unsalted butter to cook them in…. Usually this is served with warm blueberry compote…. YUM. So it could def. be a dessert if you wanted with some whipped cream… But its good without and with chocolate chips or blueberries… thats how my kiddos like it on the weekend :). If you try it I hope you enjoy, Oh and I do remember reading that you don’t always use vanilla extract to save money but if you ever want to spoil yourself purchase some Nielsen-Massey Madagascar Bourbon Pure Vanilla Extract, or even better Vanilla Bean Paste. So delicious and truly makes a nice difference. Especially if you ever make homemade chai tea lattes a fav around here…You can find it on Amazon and Williams sonoma, although I think their prices are probably higher…. So sorry to blab on and on…. My pancake recipe calls for 2 cups of buttermilk but I substitute 1 cup of yogurt (plain or vanilla, whatever I have on hand) and 1 cup of milk. I’ll have to try the sour cream sometime, it sounds good! Oh, I love this idea, too! I love that you are so honest about your cooking episodes, that you even post pictures of the stuff that didn’t turn out as planned. It looks alot like my kitchen!! 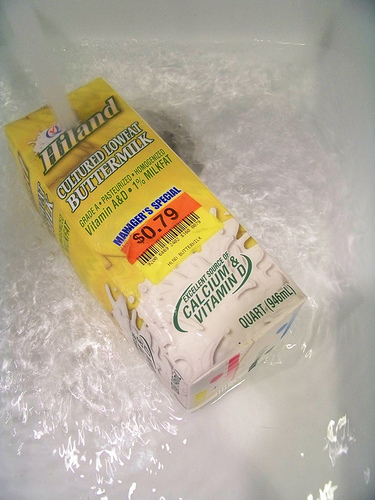 I only buy marked down buttermilk. I pour it into my pumpkin shaped silicone muffin pan and freeze. Then I have half cup portions, much easier to thaw, when I am making pancakes, etc. Someone else may have mentioned this, but did you know that you can substitute lemon juice or apple cider vinegar + milk for buttermilk? Just place 1 T lemon juice or ACV in a measuring cup for each cup of buttermilk that you will need and add the remaining amount of milk to make 1 cup. Alter the proportions as necessary for your recipe. It works with milk alternative too. The acid portion is the part that is important for the recipe to work. Wow Crystal those rolls look amazing. You did a great job. I made some meal starters today also to freeze. Rice, pizza dough, and bread dough. Oh and some cookies for snacks this week. Hi Crystal, for all of us really newbies who are still considering jumping in, would you consider a post on how to use the frozen cooked meats and also how to thaw or reheat what you’ve made. Also maybe a list of what can be frozen. That would be so awesome. I really want to try it out, but am a bit concerned with the defrosting and serving. Thanks for all you do and keeping it real! We don’t really miss our big clunker of a microwave, but are instead enjoying all the space we have re-claimed. Earlier this week I made a double batch of Morning Glory muffins, thanks to the link you posted. They were great! Definitely a keeper! This week my husband brought home a 40 lb box of bananas so I made banana bread this week. We shared some of the bread with his co-workers, our neighbors and then put some in the freezer for later. I was not able to use all the bananas now, so I peeled and froze them for use later. When I bake I have learned, it easier to do 2 batches at the time, one to bake immediately and one to freeze. I finally tried your Homemade Instant Oatmeal Packets from a year ago. I love it! Instead of packaging it into individual bags, I filled quart freezer bags with the mixture and simply pour out however much I want, adding hot water until it looks right. I confess I have to add brown sugar to make it palatable.l 🙂 I also found some Craisins in the cupboard that are the perfect finishing touch! can the honey rolls be used in the breadmaker? We do not drink buttermilk at my house and so I rarely buy it. However, I do have a few recipes that call for it. I hate to buy a whole carton when I only need a cup. I have been using the following substitute for years now and it works great. 3/4 cup of milk with 1/4 cup vinegar. Let stand for 1-2 minutes and then pour into recipe. This is probably a silly question, but are there any tricks to freezing the rolls? Do they need to cool completely before freezing? Do you let them thaw at room temperature, or do you warm them in the oven? Thanks for any tips you have to offer. I have always used your pita recipe (whole wheat kind, which I LOVE) and have never made it except in my breadmaker. I just put the ingrediants according to bread-making order and let it do the mixing and rising for me. Turns out perfect every time!